On Wednesday, April 18th, we are hosting a two hour Open Mic. As always, it is ‘originals only’. Here is your chance to sing more than the usual two song allotment. BC Songwriters hold their evenings at NY Grill & Bistro – 20204 Fraser Hwy, Langley. On Wednesday, March 21st, we’ll Spring into a Two Hour Open Mic, starting at 7:30 pm. 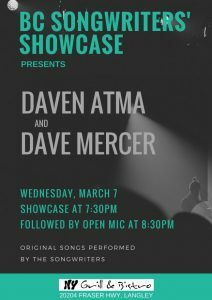 Daven Atma & Dave Mercer, starting at 7:30 pm. Open Mic follows at 8:30, for anyone wanting to perform a couple of their original tunes. Sign-ups in person, please! 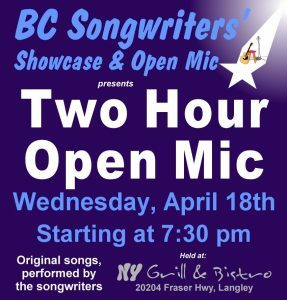 BC Songwriters hold their Showcases & Open Mic performances at NY Grill & Bistro – 20204 Fraser Hwy, Langley. 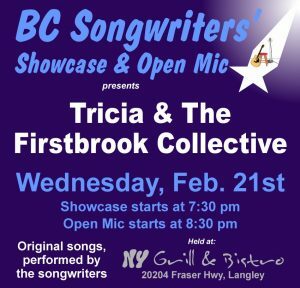 On Wednesday, February 21st, the Songwriter Showcase will feature Tricia & The Firstbrook Collective, starting at 7:30 pm. Open Mic follows at 8:30, for anyone wanting to perform a couple of their original tunes. On Wednesday, February 7th, BC Songwriters will host a 2 Hour Open Mic, starting at 7:30 pm. Sign up (as always) is in-person only, on a “first signed up, first on stage” basis, in order to perform a couple of your original songs. 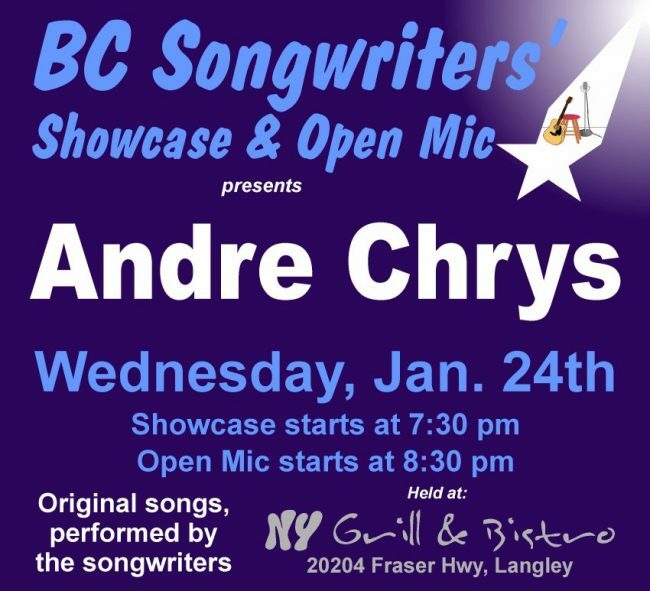 On Wednesday, January 24th, the Songwriter Showcase will feature the amazing Andre Chrys, starting at 7:30 pm. 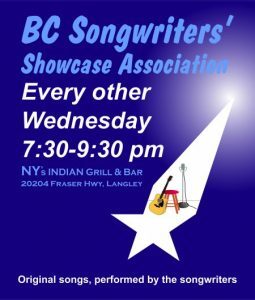 The BC Songwriters’ Showcase & Open Mic happens at NY Grill & Bistro – 20204 Fraser Hwy, Langley.